1. Preheat oven to 200ºC, gas mark 6. Grease 8 holes of a muffin tin. 2. Cut the 4 filo sheets in half and cut each half into 4 smaller squares.Brush with the butter and place 4 squares on top of each other at different angles. Press into a muffin hole, then repeat to make 8. 3. Reserve 24 gooseberries, then divide the rest between the cases. Mix the breadcrumbs with thyme and sprinkle over the gooseberries. Crumble over the cheese and place 3 gooseberries on top of each. 4. 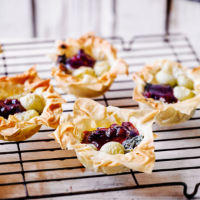 Bake for 10 minutes or until golden and the cheese has melted, then serve topped with the cranberry sauce.